Caillou and Daddy visit Mr. Hinkle to help him build a dog house. Caillou soon meets Mr. Hinkle's dogs, a mommy with her two rambunctious puppies. At first, Caillou isn't sure he feels comfortable around the dogs, but the puppies are so adorable that he can't resist playing with them. 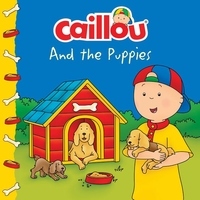 When one of the puppies disappears, Caillou helps to look for him. Fortunately, the adventurous little puppy comes out of hiding and joins his family in their new home.